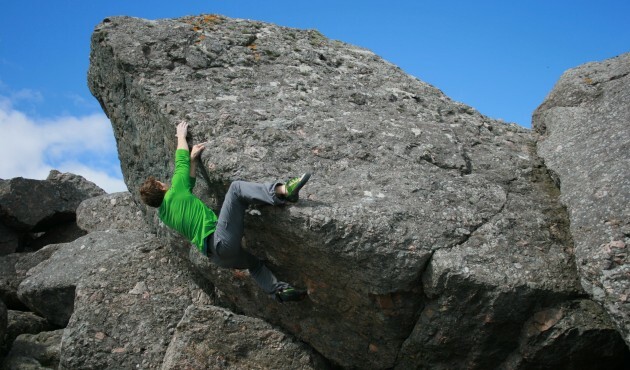 Mark Bingham discovered a new bouldering venue in Quarff last year and, unusually for Shetland, it actually includes boulders (freestanding blocks are pretty rare here)! Mark told me about the area at the climbing wall and we arranged to meet there one evening to investigate. Unfortunately the timing didn’t work out so I ended up going down by myself on a windy saturday to have a look (with mat in tow). Being in view of all the nearby houses while struggling into the gusts with a giant black slab on my back has probably left several Quarff residents questioning my sanity – thankfully, I don’t know anyone in Quarff! There are 4 boulders with problems on them, amongst a sea of smaller blocks, standing on a shelf by the sea. The problems range in grade from V0-V5. After a bit of lichen-gardening I climbed some of the easier problems up to around V3. A few weeks later Paul and I went back and finished off most of the remaining lines. A great, relatively central, venue ideal for squeezing in a few problems after work. Check out the database page for topos. All problems were established by either myself or Paul Whitworth. Still not been out there… Will have to go for wander one of these days.